Don’t worry… this isn’t about fitness, but this article started there. It is about creating… and how it is we all have a great capacity for making something from nothing… likely far beyond what even most fertile creative minds have imagined. This morning I did what I do every morning, first thing, right before showering: drop to the floor for 15 push-ups from the toes followed by 35 fast squats while the water warms up. (We’re on well water, so it can take awhile). It’s not much, I mean it’s not a workout, but it’s enough to wake up, get energized and get my circulatory system going. In just those couple minutes, I’m making muscle and making energy… making something from nothing. Of course it’s not really from nothing, but we’ll get to that in a minute. Meanwhile, it’s close enough. It’s making more than was there before, with just a little effort; effort that literally increases health and energy, and stores it as more muscle. Exercise: just 3 minutes to gain 1,440+ minutes. The action took less than two minutes, but the energy stored lasts more than a day. That’s a pretty good return on investment: 2-3 minutes to gain 1,440 minutes of benefit and more. So while it’s actually making more from less, rather than from nothing, stick with me for this productive mind trip. It’s the privilege of all creators—of humans—to make something from nothing; from less than was there before. I have a body scan calculator… an awesome digital bathroom scale that shows not only your weight, but also your fat and muscle percentage. On any given day, if I exercise a little more, I can see a clear increase in the muscle mass and a decrease in body fat, both of which reduce the biometric age. And vice versa. On any given day if I don’t exercise at all, the next morning’s reading shows less muscle, more fat, and more age, aka “real age” or “health age”. If you take care of your body, it will take care of your life, so don’t neglect your one body. I’m not awesomely fit right now. Less fit than I used to be before starting businesses that have me sitting for 10-16 hour days, 7 days a week, #WritersLife… #Passion&Purpose! However, I still prioritize doing something physical each day. A vital life begins with vigorous movement, so remember to move! It’s a miracle how capable we are as humans to create something from nothing… to make more than was there before. The Law of Attraction principles introduced to mainstream via The Secret book and movie, is available to everyone. That movie only skimmed the surface on that topic and made it seem like a wish and a prayer were all you needed to make your dreams come true. We know better of course, however the widespread success is likely not only because of the magic wand longing people tend to have, but more than that, because of something deeper. We innately know that creation is our birthright. We know innately, that creation is our birthright, and we are all wielding this law every moment of every day. But we are as children wielding crayons, often indiscriminately, as yet unaware as to what we are creating. We are still unskilled in just how much more we can do—will be able to do—with practice and training over time. The difference in our consciousness makes the difference in our creation. This concept can seem so simple that it’s easy to miss the power of this seed thought. The hardest part to completely grasp, yet the most important, is how it is that we are painting our life into existence every day, and each thought, decision and action is another stroke on the canvas of life. If you saw the movie, The Adjustment Bureau, you’ll have a cool visual of this concept. You are painting your life into existence every day. Each thought, decision and action is another stroke on the canvas of your life. An artist understands that to swipe a brush across a canvas is to create color that wasn’t there before. The potter that takes a clump of clay and molds it into a cup, has given shape to the shapeless… to a form that didn’t exist before. The writer who forges the fantasy fiction novel has pulled an idea from his head and crafted it into a world that others can enter. A game maker has created a world that others can enter and engage. A composer as well; bringing to life a song that didn’t exist before and which others can now enjoy. The audience is transported because of the artist’s creation. Changing state and making something that was virtually nothing. To manifest is to take a moment in time that was neutral, like the painters canvas, and make it more than it was before. That is our destiny as creators, and as humans… to take this idea… this life, and make it more than it was before. Creators are making something from nothing. Almost. Of course, the artist uses materials and energy and effort to bring her creation to life. It is an alchemical process of taking elements and making them into something more than they’ve ever been before. 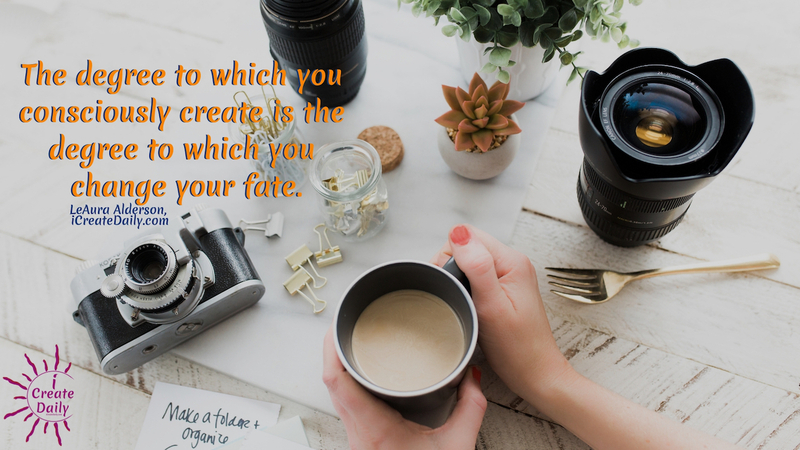 The degree to which you consciously create is the degree to which you change your fate. The creative process is related to divinity. Creative manifestation requires consciousness, will, love and matter. Those are all the elements—physical, emotional, mental and spiritual—that make the hybrid of angel and animal called human. What preceded the creative process… the gathering and crafting of materials, was the idea. That something… that ephemeral spark of bright, traveling at lightspeed across the mindscape, and caught in the dreamcatcher’s web of awareness… waiting for the artist to pluck it down from the ether and dream it to life. Idea. That ephemeral flash at lightspeed through ether, caught in a dreamcatcher’s web, a star set free to be… by artist, by author, by builder… by you. Quantum physics is fascinating, especially when it’s correlated with consciousness and creation. Without going nerdy here, it’s worth sharing this snippet on the particles of light in a vacuum. The correlation to our topic here is that physics has discovered that even a vacuum… that previously supposed void of nothingness, is actually filled with flitting bits of light. So even nothingness is filled with somethingness. We muse that this is like the mindspace where ideas are conceived… as sparks of light that leave the vacuum and become shooting stars waiting to be caught by the dream catchers of the creative mind. A vacuum is never completely empty, but instead buzzes with so-called “virtual particles” that constantly wink into and out of existence. Photons are packets of light that can pop in and out of a vacuum. Your mind is the universe of your being… its space and capacity as relatively vast as the sky. There’s no limit, and no end to the creativity possible to you and through you. What treasures… what packets of light are you bringing to life today? Reach up and pluck a star… and make something from nothing. Your life is your greatest work of art. Give it your all. Morning Lark, Night Owl or Hummingbird? Creative Workflow - Are You Linear or Radial?